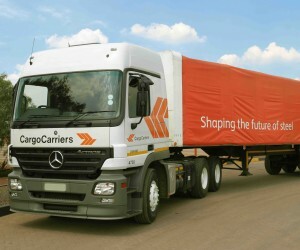 Cargo Carriers, the Johannesburg Stock Exchange-listed supply-chain solutions specialist, remains committed to providing a cutting-edge road-logistics solution to the South African steel manufacturing industry. About 190 000 South Africans earn their livelihood in the steel value chain, spanning the mining of iron-ore through to primary manufacture and fabrication further downstream. Moreover, this industry serves other critical economic sectors, which directly contribute about R600-billion towards the country’s gross-domestic product (GDP), while directly and indirectly employing about 8-million people. They include the construction and structural steel, automotive and cable manufacturing industries. The loss of this important industry would also result in South Africa only being an exporter of iron ore and importer of beneficiated steel product. This would preclude the country from exercising its comparative mineral resource endowment advantage. However, the local steel production and fabrication industry has been in a state of decline since 2010. This crisis spans the entire value chain and is evident in the inability of mines, primary steel mills and fabricators to compete, sustain jobs and invest in the necessary production infrastructure. One of the biggest challenges they face is general economic malaise which has led to a slow growth in demand. In 2015, South African steel demand stood at about 5,4-million tons compared to 5,8-million tons in 2007. Meanwhile, demand for the material and fabricated product in sub-Saharan Africa has stagnated due to low commodity and oil prices. Aged domestic production plants and related infrastructure have also contributed towards inefficiencies resulting in low capacity utilisation and substantial losses in economies of scale. At the same time, the country’s downstream steel industry has been bombarded by cheap imports of finished goods, severely eroding domestic production capacities. Total imports of manufactured steel products rose by about 250% from 2000 to 2016, while China’s contribution climbed from 12% to 54% during this period. As much as two thirds of sub-Saharan Africa’s steel is imported, with only 13,7-million tons of the 39-million tons used by the continent every year supplied at a regional level. These complexities have been compounded by rising costs of inputs, such as coking coal and energy, albeit that the proposed development of a short-term negotiated electricity pricing framework for energy-intensive industries is expected to alleviate some of this burden. Logistics is also a significant operational cost and it is, therefore, imperative that any inefficiency in the delivery of steel be eradicated. It is for this reason that those participants in both the primary and downstream steel markets have made Cargo Carriers their first point of contact for all their road-transport logistics requirements. The company continues to work closely with these customers to implement bespoke solutions that provide the flexibility they need to remain competitive in a challenging market. 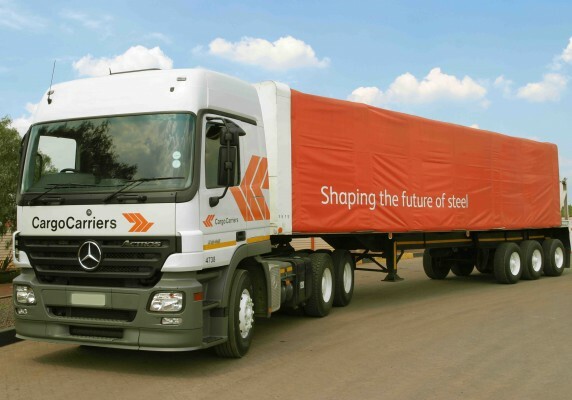 Cargo Carriers’ Steel division is based in Vanderbijlpark where its specialised trailers are deployed to move steel plates and coils throughout Gauteng to an extensive network of steel merchants on a demand basis. The company hopes that measures taken by government to safeguard the country’s steel industry will assist its customers growth, considering that they are vital components of its industrialisation strategy. Importantly, the general rate of customs duty on primary steel products was increased to 10% to safeguard hot-rolled coil and plate products for at least three years. In addition, tariff increases were implemented on a range of downstream products and rebates deployed where products are not manufactured, or additional value is added before being exported. Meanwhile, a set of principles were agreed upon for flat steel pricing in the country. This intervention is intended to ensure that steel-dependent industries remain competitive and that upstream steel mills are sustainable. However, the industry is expected to remain under pressure throughout 2018 and 2019 considering the state of the economy, although some relief can be expected from a recovery in commodity prices. Importantly, foreign-direct investment is required to kick-start large infrastructure delivery programmes and private sector property development, stimulating domestic steel demand. Cargo Carriers, therefore, continues to engage its customers formally and informally in daily meetings to ensure that it is able to support their objectives. Examples of actions taken by the company to optimise performance for its customers in this industry include preloading vehicles and increasing preventative maintenance checks, in addition to rotating drivers regularly. Moreover, it maintained on-time delivery scores of 98% and achieved positive feedback in customer service index surveys. This is in addition to upholding its 18001:2007 Occupational Health and Safety Management System and ISO 9001 and 14001 accreditations, complemented by positive customer audits. Participants in the steel industry will continue to demand only the best service from their road-freight logistics partners, and Cargo Carriers has demonstrated that it is able to deliver on these expectations.